One of my favourite parts of my job is when I get to speak to our customers to see how we can help them have the best experience possible on our website. So when the team working on the App asked me to organise a usability test for them I jumped at the chance. 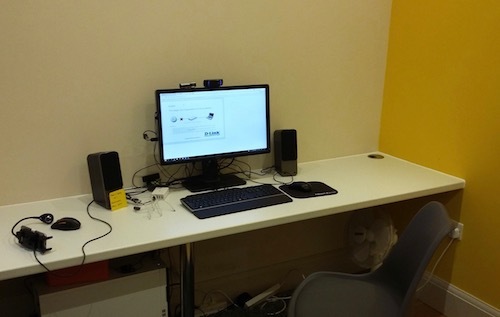 A usability test or lab test, is when we put a participant in a room with a computer or other digital device and ask them to complete various tasks to see if there are any problems. If they can do it without any prompts from the facilitator then you do not have any problems, but if they struggle or have to ask for help then you know you still have work to do. Of course there was a caveat; it needed to be before the end of October, and the last week was out due to the fact it was half term. This left me with three and a bit weeks to find a lab, find some people to test with and work out what to test. I started by looking for labs as we would be constricted by when they had availability. After a lot of research it seemed that we would need to go to London as there was nothing on the south coast. After contacting some labs who looked like they could help us test on mobile devices I had narrowed it down some more and spent a lovely afternoon in London visiting some to make my final decision. In the end we went with Fluent Studios. The fact that Wiggle had used them before helped, but their mobile testing setup was the best I had seen which was the deciding factor. With a lab booked and a date in the diary I could 1. Let my observers know and find out who could attend and 2. Start looking for participants. After the issues with the Social Media team last time I spoke to them early. They said they would be happy to put a tweet out about the testing so I wrote a screener questionnaire to help make sure we would be testing with the most appropriate people. The screener consisted of questions about whether they shopped with Wiggle, if they used the app and how they used their mobile phones. I created it in Surveymonkey and added the link to the tweet, then waited to see if anyone was interested. With seven places to fill I was really pleased to receive eleven responses from that single tweet. And looking through the responses they all seemed compatible. With a bit of organisation I got seven people booked and turned to my next task, what we wanted to test. Part of testing the app is to look at what we should be doing with it next. 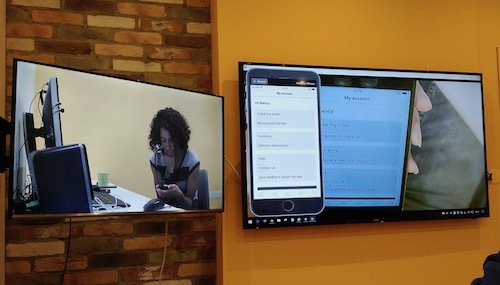 Although this would be a usability test to see how people used the app and if there were any obvious issues or bugs, we were also interested in how people use their phones to shop or if they even do. So not only did I need to come up with some tasks but also a mini interview around apps and shopping. It was also at this point I found out that we do not have a true test account for the live site. So now I needed to create an account to test with, have some vouchers created so we could shop without a card and let both Customer Service and Payment Protection know that there would be some weird stuff happening on the day of testing. Somehow even with some last minute challenges everything was ready for the day of the test. I was in the lab just after 9am where the team at Fluent Studios helped me get set up. The rest of the team turned up and I got them briefed, then we were good to go. Our first participant had arrived and it was time to see if everything would work. Even with a few internet connection issues the tests went really well. If I was going to do it again, I would do a full run through a couple of times with someone, rather than the bitty practice I did which might have flagged a couple of issues, but they were not of much significance. Our last two participants cancelled, one due to me messing up the times, and one due to a sick child. Even with only five tests we still got so much value from the sessions we did run and I hope it means the company will be up for doing more with our customers. Now I have a week to go back over everything and write up the results before our follow up meeting where we decide what to do next.